We present a vastly ambitious and inclusive agenda. It raises potentially hundreds of realistic and reasonable questions, which we hope to address in clear and persuasive terms, in ways that magnetize more creative energy into our alliance. Who are these people? What makes them pioneers? Why are they credible? Why should we listen to them? Are they are all saying the same thing? What is an "axial age"? ...reconciling destructive tensions that have plagued the human family since the beginning of time. Why is it reasonable to hope for changing fundamental human tendencies? ...based on universal elements shared by all the religious, spiritual, wisdom and philosophic traditions in the world. You're going to take on ALL this stuff at the same time? 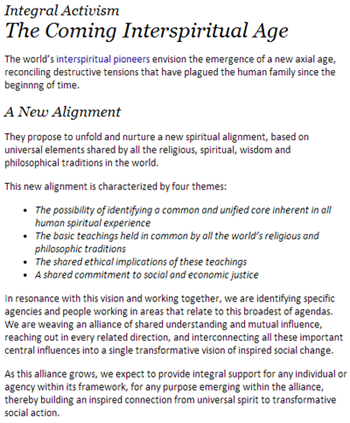 This new alignment is characterized by four themes.